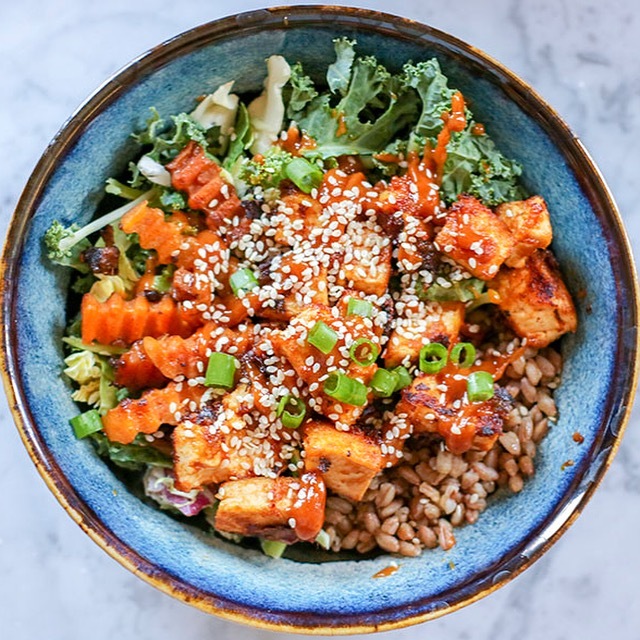 Before we even begin to discuss this INCREDIBLE Crispy Peanut Tofu, I must give MAJOR credit to the amazing and fabulous, Lindsay Ostrom, the powerhouse behind one of my FAVORITE food blogs, Pinch of Yum. 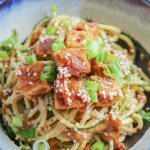 This recipe was completely and totally inspired by Lindsay’s recipe for Sesame Zoodles with Crispy Tofu. In fact, this is basically Lindsay’s recipe – I simply made a few alterations! 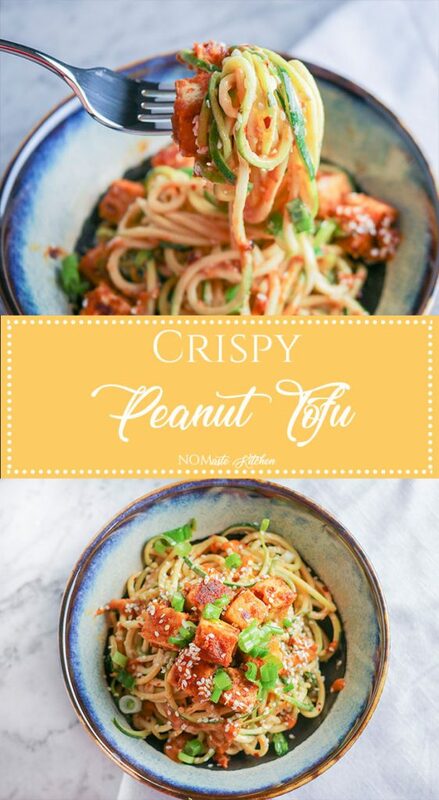 This Crispy Peanut Tofu though… OMG! I have now made it twice in one week. And I have eaten it for pretty much every meal – because seriously, the Crispy Peanut Tofu IS that good. I have enjoyed it over zoodles (as suggested by Lindsay! 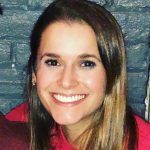 ), sweet potato noodles, farro, cauliflower rice, and salad greens – so far, I have not found a combination that I haven’t liked. Usually, when I find a recipe that I like – I play with it. I change an ingredient here or there, test the proportions, see if there are any ingredients that should be added or removed. I do this until I ultimately find a combination of ingredients that, in my mind, can’t be beat. Honestly, Lindsay’s recipe IS indeed perfect. It is easy, flavorful, AND incredibly delicious. So why did I change anything? Because it is fun! I pretty much used the same base ingredients – peanut butter, soy sauce, sesame oil, ginger, garlic, spicy chili sauce – and of course crispy fried tofu. But I altered some of the proportions. I wanted my sauce to be a slightly thinner, so I put in additional soy sauce. I reduced the amount of oil since I was now eating it for the 15th time in a row, not much – just from 1/3 cup to 1/4 cup. And I used honey instead of white sugar for a little added flavor/to keep it natural. I cannot wait until you all try this recipe it is seriously so delicious. Its not just a Pinch of Yum, its a fistful of yum. 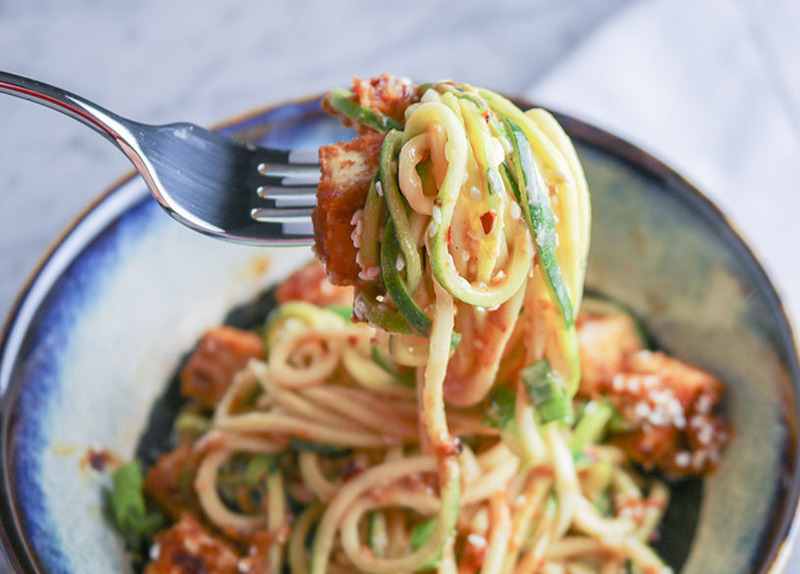 Inspired by the original Pinch of Yum recipe for Spicy Zoodles with Crispy Tofu, this Crispy Peanut Tofu is quite possibly my new favorite protein. 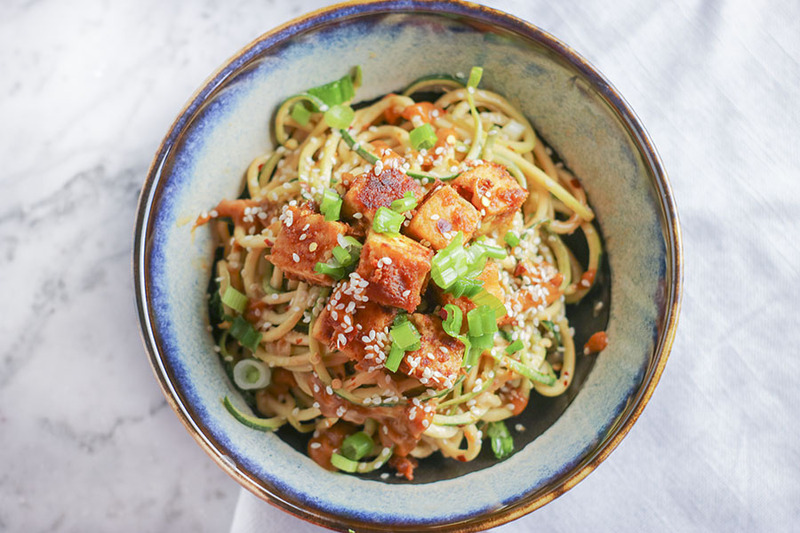 Over cold zoodles, warm farro, sweet potato noodles, rice, cauliflower rice, greens, or anything else - loaded with Spicy Peanut Sauce, this tofu is in for the win! In a small bowl, combine all sauce ingredients. Stir thoroughly to combine all ingredients. Line a plate with a kitchen towel or paper towel, drain all liquid from tofu container. Lay tofu on top of towel and use and additional towel to press excess moisture out of tofu. Cut tofu into bite-sized pieces. Heat sesame oil in a non-stick pan, add tofu to pain and stir fry until golden brown. This will take a few minutes. Add about 1/2-2/3 cup sauce to tofu in pan and simmer. 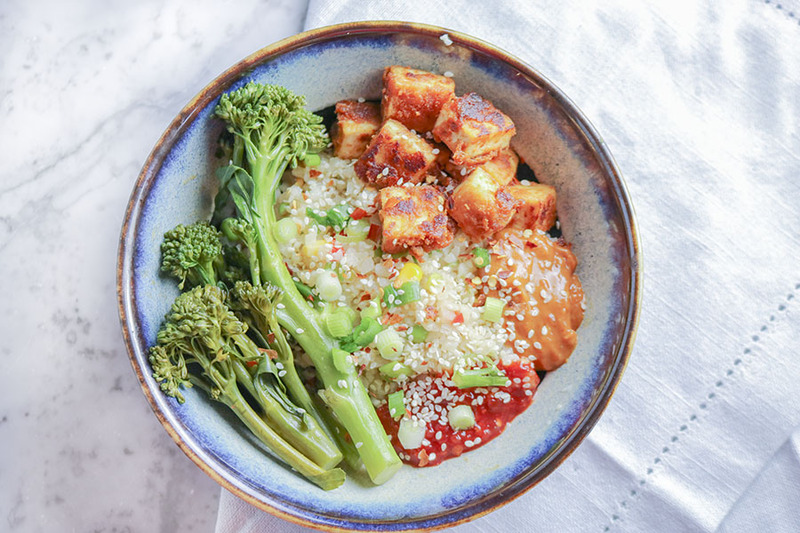 The sauce will thicken and become crispy - gently flip tofu in sauce, scraping all the yummy brown bits off the pan as you go! 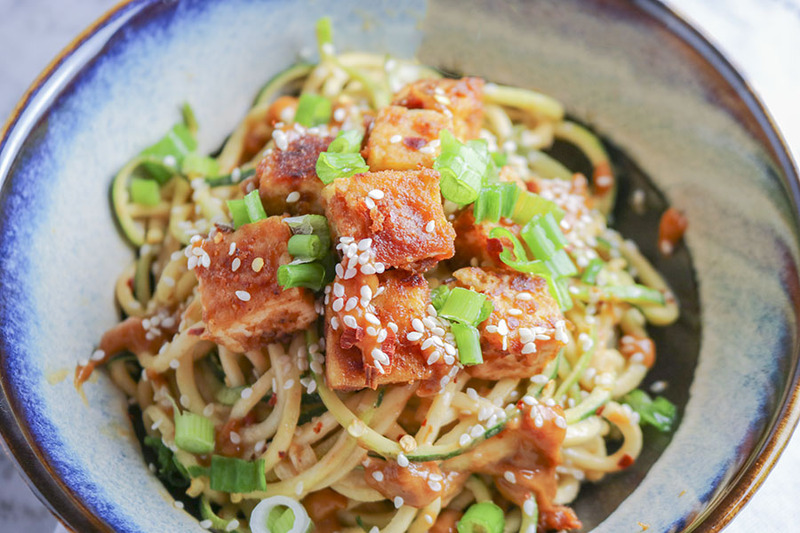 Enjoy your tofu over a bed of cold zoodles, warm farro, rice, cauliflower rice, sweet potato noodles, greens, or literally anything else! Simply toss an additional half cup of sauce with whatever bed of deliciousness you choose to accompany your tofu! Top with sesame seeds and scallions. Storage: Refrigerate tofu in an airtight container separate from remaining sauce. Store an additional zoodles, farro, or rice separately as well.